Being a short tubby bugger myself, I love the Hunt! He is a beast. His punching power appears to come from his great timing, his accuracy, his strength and bodyweight & his use of the Russian Hook and the Overhand Right which are perfect for a man of his build. I didn’t think he would have taken on Stefan Struve on the feet like he did though. I believe, quite obviously I guess, that his best asset is his toughness. If a big guy throws a jab at him, he’ll walk through it; or at least stay right there; in the pocket. Whilst the rest of us would move back, out of range, he’ll slip it on just take it on his forehead to get ‘in the pocket’. His most successful punches appear to be his own version of the Russian left hook. One of Fedor’s favourites; he turns his thumb over and down so his little finger is positioned at the top when he makes contact with his opponent’s chin. He also leaps into it quite often too, given him some extra range (something you’d probably get told off for in a boxing class). Turning the thumb over gives the punch the range of a straight punch but the power of a looping punch. He also loves the overhand right. If you haven’t seen this punch, it’s another MMA mainstream technique that is rarely seen in boxing. He lowers his level by bowing forwards and throws his arm in a straight looping arc, as if he’s bowling a ball. The Hunt is also known for his powerful uppercut; especially since his win over Nelson. Hunt has 2 uppercut KO’s in the UFC. 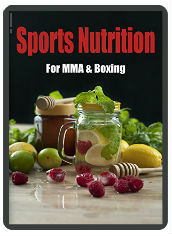 He timed both perfectly, as his opponents dropped their heads; in defence in the first instance, and against Roy Nelson he caught Roy just as he seemed to be lining up one of his overhand rights. As you might expect, Hunt’s uppercuts are pretty efficient in terms of energy conservation. He doesn’t drop his level or bend his legs, he just drops his hand to his waist and whips it upwards. One thing to note however, is the way he throws both KO uppercuts at 45 degrees; rather than completely vertical. Perhaps this gives the extra KO power. 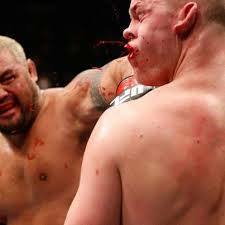 We’ve seen Mark Hunt get KO’d himself a couple of times. Most recently against Cigano and a spinning heel kick. Pretty sure that would have KO’d an elephant. I think it’s fair to say however, that Hunt still has arguably the best chin in the HW division right now, and is definitely one of the toughest guys in the top tier. It will be interesting to see how his style matches up against Werdum. Hunt is unbelievably strong, there’s a vid of him knocking around the internet, beating Bob Sapp, a sumo guy and a World’s Strongest Man competitor at tug of war. I’m pretty sure that must translate into some sick punching power too!